The expression “It’s raining cats and frogs” might not hold any more water with this £12.99 Frog Weather Reporter. After all, animals are pretty much good barometers when it comes to telling us whether something weird is about to happen with the environment or weather – just see them run helter skelter before a huge earthquake and you will get my drift. 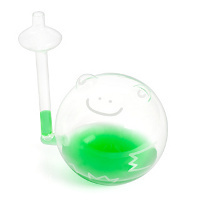 Well, the Frog Weather Reporter will definitely be able to pique the curious mind in your home as it goes about predicting the day’s weather, where rising water means there is a chance of rain (and vice versa, obviously). Made out of high quality handblown glass, this can be considered to be a perfect addition to any desktop. All you need to do is add your choice of liquid inside and you’re good to go – water is best, of course, if you want the most accurate results. If you want to add to the atmosphere, just drop in some food coloring using the included syringe and you’re good to go.